OMG Posters! 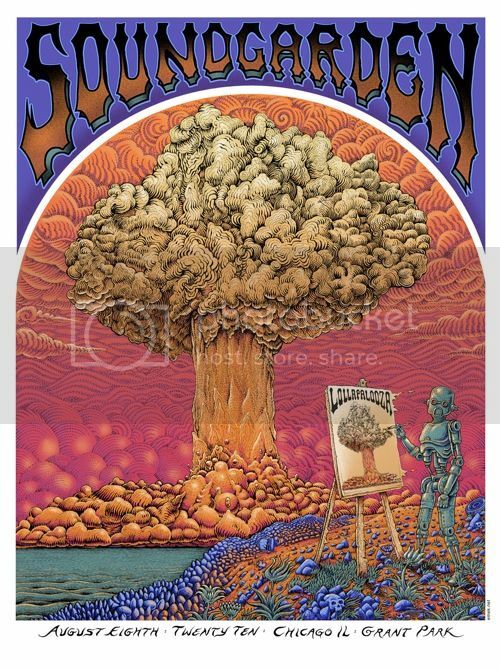 » Archive Emek's Soundgarden Poster (Onsale Info) - OMG Posters! Emek will release copies of his Soundgarden poster from Lollapalooza later today. It’s an 18″ x 24″ screenprint, has an edition of 100, and will be $75. His copies are the only ones that are signed/numbered. They go up today (Thursday, August 19th) at 12pm Pacific Time. Visit the store/info tab at Emek.net. There were 750 of these made I hear for the band. (Not signed/numbered) You can still buy them on their site at http://www.soundgardenworld.com/shop so… yeah. I’m not feeling the $75 price tag on this one. My thoughts exactly, Greg. A signature isn’t worth an extra $50 to me. Emek! So much work put into this, obviously a talented man, but this just isn’t a nice finished product.